- auto sequential mode to overtake, for example, remaining in automatic mode while using the functions of the sequential mode. A Sport function is available in automatic or sequential mode for a more dynamic style of driving. M. + / - Sequential mode with manual changing of the gears. - push the lever forwards to change up a gear, - or pull the lever rearwards to change down a gear. +. Change up paddle to the right of the steering wheel. -. Change down paddle to the left of the steering wheel. 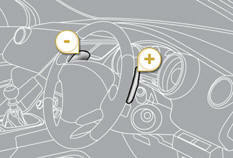 The steering mounted paddles cannot be used to select neutral or engage or disengage reverse gear. 1, 2, 3, 4, 5, 6. Gears in sequential mode AUTO. This comes on when the automatic mode is selected. It goes off on changing to sequential mode. Place your foot on the brake when this warning lamp fl ashes (e.g. : when starting the engine). There is an audible signal when reverse gear is engaged. N fl ashes in the instrument panel, accompanied by an audible signal and a message in the multifunction screen, if the gear lever is not in position N on starting. Foot on brake fl ashes in the instrument panel, accompanied by an audible signal and a message in the multifunction screen, if the brake pedal is not pressed on starting. Keep your foot on the brake pedal, move the gear lever to position A or M to go forwards, or R to go backwards. Take your foot off the brake pedal, you can then move off. 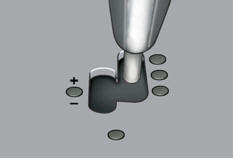 The parking brake is released automatically, otherwise release it manually. AUTO and 1 or R appear in the instrument panel screen. If position R , A or M is selected, even with the engine at idle, if the brakes are released the vehicle moves without any action on the accelerator. Never leave children unsupervised in the vehicle when the engine is running. When carrying out maintenance on the vehicle with the engine running, apply the parking brake and select position N .
When the vehicle has moved off, select position M to change to sequential mode. AUTO disappears and the gears engaged appear in succession in the instrument panel screen. 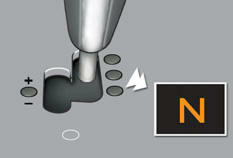 When braking or slowing down, the gearbox changes down automatically to allow vehicle to pull away in the correct gear. At very low speed, if reverse gear is requested, this will only be taken into account when the vehicle is immobilised. The Foot on brake warning lamp may fl ash in the instrument panel to prompt you to brake. Following use of the sequential mode, select position A to return to the automatic mode. - profi le of the road. This mode enables you to overtake, for example, remaining in automatic mode while using the functions of the sequential mode. Operate the + or - steering mounted paddle. Following selection of the sequential mode or automatic mode, press button S to activate the Sport setting which offers you a more dynamic style of driving. Press button S again to return to normal settings. The gearbox returns to normal mode automatically each time the ignition is switched off. When immobilising the vehicle, with the engine running, it is essential to place the gear lever in neutral N .
With the ignition on, if this warning lamp comes on and AUTO fl ashes, accompanied by an audible signal and a message in the multifunction screen, this indicates a fault with the gearbox.